This week, Kuredu Ocean Watersport experienced perfect conditions for catamaran lessons. The warm tropical breezes combined with the sheltered waters inside the atoll create the ideal location to learn to sail, with students having great fun tacking and jibing as they learned the difference between the sheets and sails, aft and bow, windward and leeward sides and all the time dodging the boom. 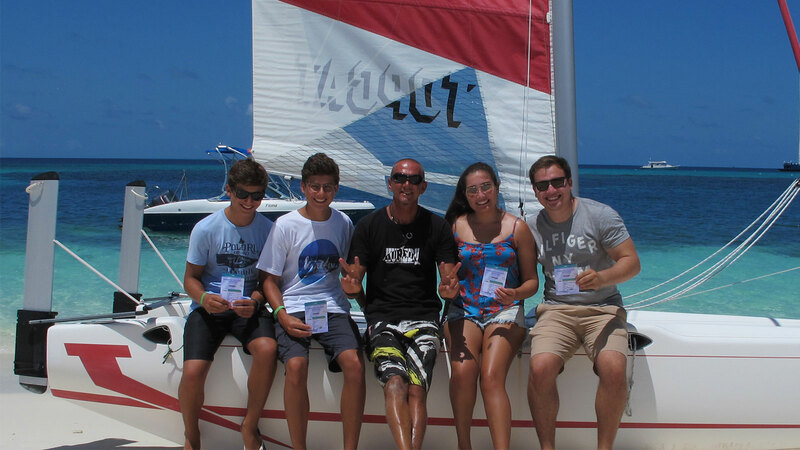 Luke, Nick, Junior and Louise were among those who joined us for lessons this week, completing their sailing course during their stay at the resort. They covered all the technical and safety aspects of catamaran sailing during the course, and managed to fit in a few races along the way, leaving them to be confident, and safe sailors for the future. Having completed their sailing this week, the whole family are eligible to take advantage of special offer, where if you complete a sailing course with us during August, you may then use the catamarans free of charge*, to continue to hone your skills for the remainder of your stay on the island. – 5-hour short course: teaches you the basic sailing skills, including capsize recovery and safety procedures, as well as equipment set up and care ($179). – 10-hour full course: covers the above along with more detailed theory and advanced manoeuvres ($279). With the great conditions for sailing we are currently experiencing, make sure you come by and find out more about learning to sail to paradise, and other great adventures to experience during your stay with us.